Romano peppers confuse me. Some people call them ramiro, some romano, some romero. I don't know which version is correct, or even if they are the same thing, but I digress. This is one of my most googled for recipes, and it was originally one of my mum's creations. It is incredibly simple, and incredibly delicious. But aren't the simplest things usually the best? 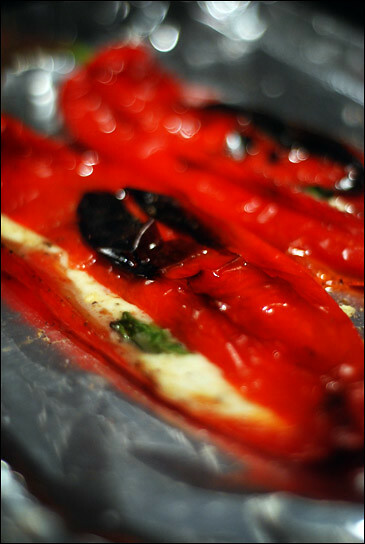 Place the peppers under a hot grill for 10-15 minutes, turning occasionally. You want the skin to blacken in places, but not all over. Once sufficiently blackened, remove from the grill and set aside to cool. Meanwhile, turn the oven on to about 180°C. Once the peppers are cooled enough to handle, carefully make a slit from top to bottom, taking care not to slice through both sides. Open them out a little and, taking care not to tear the pepper, remove the seeds. Slice the Mozzarella into 5mm half moons - this will make it easier to fill the pepper than with full slices - and place inside the pepper. I found 4 half-moons filled my peppers. Then, tear the basil and scatter over the Mozzarella. Season with a little salt and pepper then drizzle with olive oil. Bake in the oven for 5-10 minutes and then serve. I think these are lovely on their own as a starter, or served with various salads as a main.